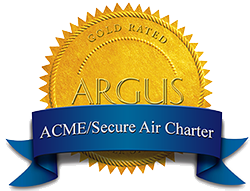 The ARGUS system rates aircraft safety standards for operators. ARGUS International operates an independent third-party due diligence rating system. This unbiased rating system assures you, the client, know the safety standards of the operator you choose. We are proud to hold an ARGUS Gold rating. To achieve this rating, ARGUS conducts in-depth research. Historical information on the certificate, pilots and aircraft serial numbers are applied to achieve a rating, and these factors are processed and scored. This information is compared with other similar operations to determine whether or not the applicant qualifies for ARGUS Gold Rating.